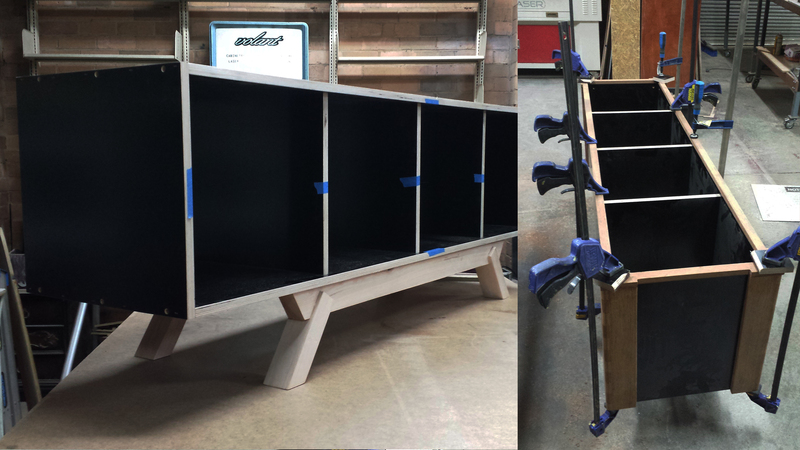 Heres some photos of the cabinet taking shape. I’ve used 18mm form ply for the carcass which I had left over from another project. I find this the best material by far for internal cabinet surfaces because of its smooth non porous finish, easy to wipe clean and strong construction character. I wanted to steer away from any visible plywood edges so I’ve capped the front edge with merbau to match the finger join corners I made earlier. love your work. Do you have some contact details so I can get in touch with you to commission some work? Thanks for getting in contact. Ive been overseas travelling. Im back in Melbourne in a few days. If your still in need of anything you can send me an email with your details I’ll be in touch.